Published in 2006, a British literature professor surveyed book critics, editors and academics to devise this list of so-called must reads, although they are not necessarily "the best books of all time." The description states, "For discerning bibliophiles and readers who enjoy unforgettable classic literature, 1001 Books You Must Read Before You Die is a trove of reviews covering a century of memorable writing. Each work of literature featured here is a seminal work key to understanding and appreciating the written word." Most of the list is what you would expect: Dickens, Austen, Tolstoy, etc. The most enlightening members of the list are the books published in the 20th century to the present. Some authors aren't all that surprising, like Philip Roth, Kazuo Ishiguro, and Margaret Atwood. But there are dozens of others I've never heard of - and I claim to be a librarian! Most of the books are novels, but there are a few literary nonfiction works, such as Fear and Loathing in Las Vegas, and the occasional narrative verse. Longstanding members of the literary canon, like Shakespeare and Dickinson, are left out because they wrote plays and poetry, respectively. A second edition of the book published in 2008 includes more international authors (i.e., less white men). There are several online discussion groups at social networking sites for book lovers, such as Goodreads and Shelfari, that serve the slightly OCD set like myself who can't resist this kind of list. I am a member of Goodreads, and it is great fun to engage in debates on the merits or enjoyability factor of the books on the list. But by far the most heated conversations center around what should or should not be on the list, with some members going so far as to create personalized reading lists. One really fun feature is this downloadable Excel spreadsheet that will allow you to track the books you've read from the list as well as keep a running tally of how many you'll need to read each year if you plan to finish the list before you die (assuming you live to the average life expectancy for a Western male or female). 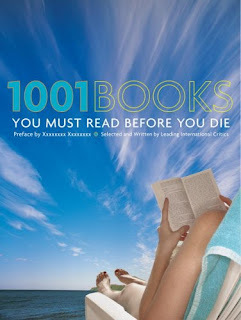 I wouldn't suggest using the 1001 Books You Must Read Before You Die as the end-all be-all of great books. There is a lot of worthwhile reading available. And even though I don't hold books from the list to the same 100-pages-or-quit standard I keep for other books, if it is a chore for me to finish a book from the list, I forget it and move on. (A recent casualty: Kim by Rudyard Kipling. I just couldn't get into it.) There's too much out there to waste time on something you have to force yourself to read. I suggest using the list as a guide to great literature you never read in school or great authors you've never considered before. Or at the very least, use the list to stimulate a conversation among ardent readers.